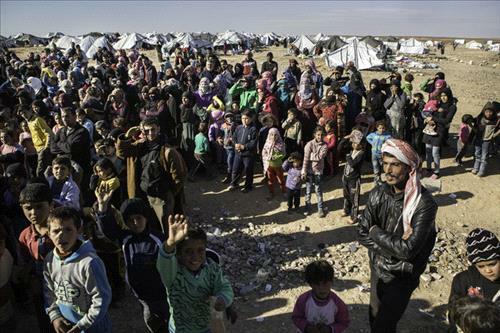 AMMONNEWS - The United Nations on Wednesday urged warring parties in Syria to allow basic health service deliveries to tens of thousands of increasingly desperate Syrians trapped in the desert near the Jordanian border. The global body's fund for children, UNICEF, said two babies - a five-day-old boy and a four-month-old girl - without access to hospitals have died in the past 48 hours near the Rukban border crossing. "Once again, UNICEF appeals to all parties to the conflict in Syria and those who have influence over them, to allow and facilitate access to basic services including health for children and families," Geert Cappelaere, the agency's Middle East and North Africa director, said in a statement. The United Nations last year said about 45,000 people, mostly women and children, were trapped in Rukban near Syria's borders with Jordan and Iraq. A suicide bombing claimed by the Islamic State (IS) group in June 2016 killed seven Jordanian soldiers in a no-man's land near the Rukban crossing. On Wednesday, UNICEF said that while one clinic on the Jordanian side of the frontier continues to treat urgent cases, the situation demands more sophisticated health care that is "only available in hospitals". "The situation for the estimated 45,000 people - among them many children - will further worsen with the cold winter months fast approaching, especially when temperatures dip below freezing point in the harsh desert conditions," Cappelaere said. Human-rights groups have called on Amman to allow trapped Syrians entry into Jordan for years. "Jordan should immediately allow humanitarian agencies to resume life-saving aid deliveries to 70,000 Syrians stuck in appalling conditions at its northeastern border," Human Rights Watch said in a 2016 report. "The authorities should also resume procedures allowing Syrians to leave the border area for refugee screening in Jordan." Earlier this year, Amnesty International also called on the Jordanian government to open its borders to fleeing Syrians. "People fleeing war in Syria are in a desperate life-or-death situation, and the Jordanian government cannot simply abandon them," Mouna Elkekhia, Amnesty’s advisor on refugee and migrant rights, said in a statement in June. "Jordan has a duty to protect refugees from Syria fleeing conflict and persecution, and to allow them to enter the country. Closing the border to people in need of protection violates Jordan’s international obligations." Cappelaere from UNICEF echoed that call, saying "it is time to finally put an end to the war on children". "History will judge us and the death of children, preventable in many cases, will continue to chase us."